Fennel (Foeniculum vulgare) is a highly savory and aromatic herb belonging to family Umbelliferae or Apiaceae. The fennel seeds are similar to Anise seeds in taste and looks. The seeds have many culinary uses with great health benefits. Fennel seeds constitute an integral part of Mediterranean food; however, they are now consumed all over the world. In India Fennel seeds are known as saunf. Let’s take a look at what benefits these seeds have to offer. 1. Antioxidants: Fennel seeds contain many anti-oxidants like quercetin and kaempferol. The anti-oxidants are important in getting rid of toxic free radicals that can cause several cancers and lead to many skin problems too. Hence regular use of fennel seeds prevents cancer and keeps skin healthy. 2. Dietary fibers: Fennel seeds are a good source of dietary fibers. The fibers are important in improving digestion and bowel function. Fibers also help in alleviating constipation, flatulence, bloating and stomach upset. 3. Preventing neurological conditions: Another benefit of consuming fennel seeds is preventing various neurological conditions. The mechanism again involves the anti-oxidants present in the seeds. 4. Cancer: As discussed already the presence of anti-oxidants in the fennel seeds take care of free radicals thus providing some protection against cancer. 5. Source of copper: Fennel seeds are a good source of copper. Copper is essential in many process of body responsible for growth, homeostasis, tissue growth and repair. Copper is also responsible stimulating immune system. Copper deficiency leads to anemia. 6. Getting rid of cholesterol: The fibers present in fennel binds to bile salts and thus prevent cholesterol re-absorption from the arteries. Maintaining cholesterol levels helps in preventing heart diseases. 7. Cardiovascular benefits: Fennel seeds can also help in regulating blood pressure and heart rate. They have a good content of potassium in them, which is responsible for keeping the blood pressure in check. 8. Source of Zinc: Another trace mineral present in fennel seeds is zinc. Zinc is essential for proper growth of development of the human body. 9. Other health benefits: More benefits of fennel seeds include relief in colitis, painful menstruation, hirsutism, airway swelling, bronchitis and cough. 10. Fennel seeds have soothing effect on skin. The action can be attributed to the anti-inflammatory action of fennel. 11. Fennel seeds are rich source of many trace minerals like zinc, selenium, iron, manganese and calcium. When your body is nourished fully, it shows on the skin too. 12. Fennel seeds also have significant effect on acne, thus rid the skin of pimple and also make it spots-free. 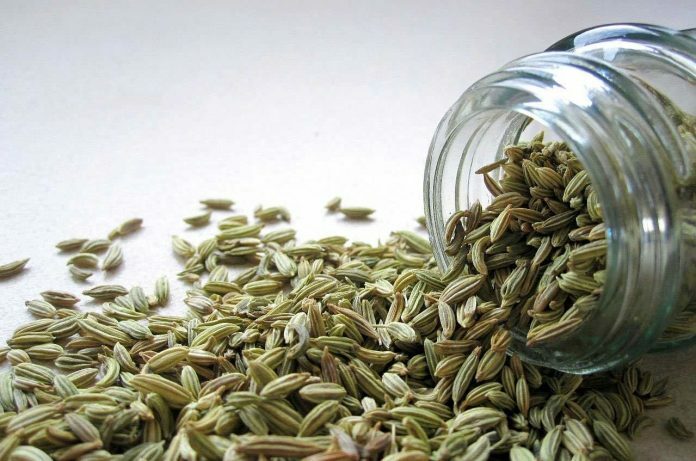 You can consume fennel in the form of tea, either by ready made preparations or putting some crushed seeds in the tea. 13. Another reason why fennel seeds are useful to the skin is because they provide several vitamins necessary for keeping skin perfect. 14. Fennel seeds are great for hair too as they keep dandruff at bay, take care of itching, and prevent hair fall. 15. Being rich in anti-oxidants fennel seeds also help keep the skin young and radiant. Fennel tea: You can either buy prepared fennel tea from the market or crush some seeds and add to the water while preparing the tea. As face mask: Add a spoonful of fennel seeds in boiling water (half cup). Cool it down. Take a spoonful each of honey and oatmeal and add the solution of fennel seeds in it. Prepare a smooth paste and use as a face mask for 20-30 minutes. Wash with warm water. As a skin toner: Boil a handful of fennel seeds in water. Allow the water to cool down. After that add few drops of fennel seed essential oil to the solution. Sieve the remove the left over seeds. You can apply it on your skin using cotton as many times you want. As steam facial: Add a spoonful of seeds in boiling water. Expose you face to the steam while covering your neck and head with a towel (like another steam facial). Repeat it twice a week for a radiant skin. Caution: Do not use the fennel seeds if you are allergic to them. Also, do not use them during pregnancy, breastfeeding and any hormone-sensitive condition. If you liked the article don’t forget to share your feedback in the comments below.